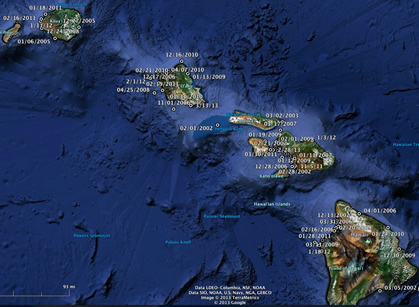 Hawaii’s 2012-2013 Whale Entanglement Season Survey – Neptune 911! The Hawaiian Islands Large Whale Entanglement Response Network, now in its 11th season, comprises over 250 members who have received various levels of training in order to support large whale response efforts statewide. More than 340 hours of training have been conducted since 2002. 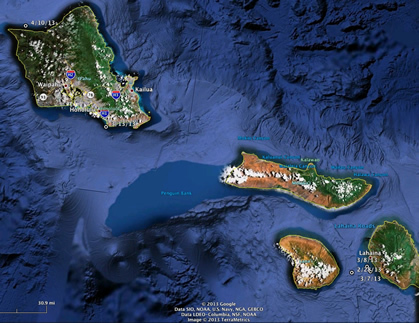 Caches of specially designed equipment have been established on the islands of Hawaiʻi, Maui, Oʻahu, and Kauaʻi to support entanglement response efforts (see Figure 1). Figure 1: Confirmed Entanglement Reports from Hawaiʻi between 2002 and 2013. Since 2002, the Sanctuary has received more than 230 reports of whales entangled in gear. The earliest confirmed report of a humpback whale entangled based on the breeding/ calving season was Nov 1 (2007), while the latest was April 25 (2008). Confirmed reports generally start in December, increase in frequency through February, and then decline into April (see Figure 2). 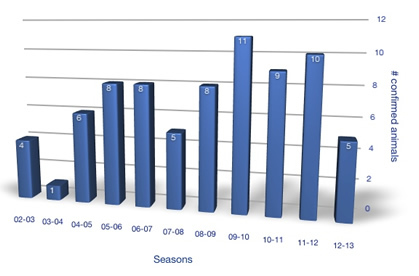 The number of reports has generally increased each season (see Figure 3). Overall, 118 reports were confirmed as truly involving entangled large whales, representing as many as 75 different individuals (see Figure 4). All but three of these reports – a sei and two sperm whales, were Humpback whales. 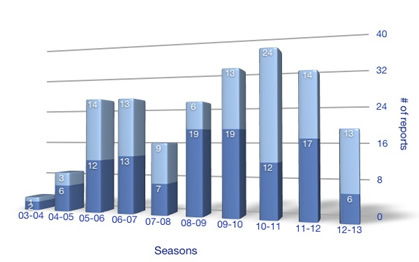 Figure 2: Entanglement Reports throughout the Season (2002-2013). The Network does not, or cannot, respond to every report of an entangled whale. Past responses and thorough vetting of initial entanglement reports has shown that approximately half (48%) of reports here in Hawaiʻi have been misreported or cannot be confirmed (Lyman et al, 2007). This last season the percentage of unconfirmed reports (i.e. unable to confirm or confirmed as not representing an entangled whale) increased to 68.4% (N=19). Examples of misreports include: white-flippered humpback whales interpreted as carrying gear; animals in the proximity of gear, but not entangled; reflections off the wet backs of animals interpreted as buoys; calves being interpreted as gear; and surface behaviors, like breaching, being interpreted as animals trying to throw an entanglement. 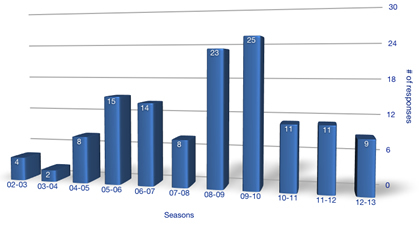 Figure 3 shows the total number of reports received each season broken down by confirmed and unconfirmed. Since 2002, the Network has a mounted over 129 on-water or in-air responses. In those cases when an on-water response should and could be mounted, the network has a 35% success rate freeing entangled large whales of all or significant amounts of gear. Many reports come in too late in the day; represent animals too far offshore, or in conditions that are not conducive (e.g. rough sea state) for mounting rescue efforts. However, the biggest contributor to an unsuccessful response is simply not re-locating the animal. If there is no standby vessel, then an entangled whale ends up being a rather large needle in an even larger haystack. Figure 3: Large Whale Entanglement Reports from Hawaiʻi between 2002 and 2013 seasons. Figure 4: Number of Confirmed Animals Reported Entangled in Hawaiʻi between 2002 and 2013 seasons. Figure 5: Number of Responses to Entangled Whales in Hawaiʻi between 2002 and 2013 seasons. Since 2002, the Network has removed or recovered over 7,000 feet of entangling gear (represents line greater than or equal to 3/8″ diameter) from 17 whales (16 humpbacks and 1 sei whale) around the main Hawaiian Islands. Animals have been confirmed entangled in local fishing gear (traps and monofilament), mooring gear, marine debris, and active fished gear set as far away as Alaska. To date, 10 humpbacks reported entangled in Hawaiʻi have been confirmed to have gear from Alaska. Seven (7) of the reports of Alaska gear were commercial trap gear. The greatest known straight-line distance (accounting for obstacles) a whale has carried gear is over 2,450 nm (between Wrangell, Alaska and the island of Maui). Over the last several years the number of entanglements reported in local pot gear has increased. To date, at least 10 animals have been reported entangled in trap gear set around the main Hawaiian Islands. 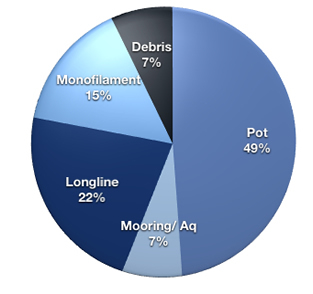 Figure 6: Percentage of Gear Types Removed from or Documented on Entangled Humpback Whales off Hawaiʻi between 2003 and 2013. 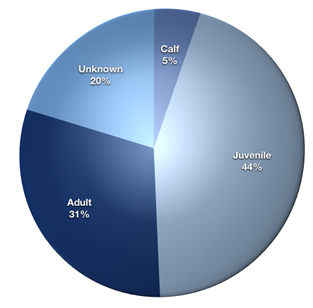 Since 2002 the largest percentage of animals confirmed entangled have been juveniles (n=33). Many of these reports were received early in the season. Reports of juveniles are based on size, and thus may represent a degree of error (e.g. a small adult male may be reported as a juvenile). Adults were the next most frequent age class at 31% (n=22). Only 4 calves have been confirmed entangled in Hawaiʻi since 2001 (see Figure 7). However, 2 different calves were reported entangled this past season. The 2012-2013 humpback whale season (November 1, 2012 – May 15, 2013) had the fourth lowest number of large whale entanglement reports of any season since 2002. Only 19 reports were received. Six (6) reports were confirmed, which amounted to 5 different animals. Figure 8: Location of Confirmed Entanglement Reports during the 2012- 2013 Season. The network mounted 7 on-water, and 2 aerial response efforts to 5 different entangled whales. Three (3) animals were never re-located during response efforts. One (1) disentanglement effort to free an entangled humpback whale calf off Maui was unsuccessful. One animal over a two-day effort was freed of all entangling gear. Maui Nui (waters leeward of the island of Maui) had the most confirmed cases of entangled large whales this season with 3 cases. There were also 2 confirmed cases off Oʻahu (see Figure 8). Of the gear removed or documented on the animals this season, 2 were local crab pot (trap) gear and 3 were not identified. Two (2) of the entangled humpback whales were calves, 2 adults, and 1 juvenile. Figure 9: Amount of outreach and training targeted towards entanglement threat and response (2002-2013) in Hawaiʻi. Just the opposite of last season; the beginning of the season had few confirmed reports, with the first confirmed report not received until February 28. The number of reports and number of entangled animals were lower than recent seasons. The number of reports received was generally half and the number of confirmed reports was about one-third of what has been received during the past several seasons. The 5 confirmed entanglement cases represent the lowest number (received) since the 2007-2008 season. In addition to the lower number of reports and confirmed cases, only two animals were re- located during response efforts. Both cases ended up being extremely difficult disentanglement efforts. The first – a calf, had just a single wrap of line wrapped tightly around its body forward of its pectoral flippers, with nothing trailing to provide access. The second – a juvenile, was entangled around its tailstock and fluke blades, with gear trailing. However, the animal was not cooperative in that it did not slow down and the entanglement was starting to cut into the leading edge of the fluke blades. A response was mounted for every confirmed case received and two cases resulted in multiple responses. Nineteen (19) reports of entangled whales were received this season (13 unconfirmed and 6 confirmed). As many as 5 humpback whales were confirmed entangled in gear, which represents the lowest number of animals reported within a season since the 2007-2008 season. Three (3) of the entangled whales were initially sighted within Sanctuary waters. Maui Nui waters had the most reports (2 off Oʻahu, 3 off Maui). Two (2) reports involved calves, 2 were adults, and 1 was a juvenile. There were 9 responses mounted, which was slightly lower than last season. Responses represented 6 on-water and 2 aerial efforts. USCG and USCG Auxiliary mounted aerial response effort. The United States Coast Guard mounted at least 3 responses towards entangled whales. DLNR were involved in 2 response efforts. response (e.g. disentanglement or tagging efforts). and Research (Mark Deakos), Keiki Koholā Project (Rachel Cartwright), and NOAA’s Pacific Islands Fisheries Science Center (Chad Yoshinaga), assisted with response efforts. Tour industry platforms from Ultimate Whale Watch, the Maui Nui, Great White, Crosswinds II, North Shore Sailing Charters, Man-o-War, and Trilogy Excursions assisted and were instrumental in providing sightings, documentation, and monitoring of entangled animals. The charter fishing vessel, Lucky Strike II, assisted greatly in re-locating an entangled animal. Support was also provided by the United States Coast Guard (Oʻahu and Maui stations) and the USCG Auxiliary; Hawaiʻi’s Department of Conservation and Resource Enforcement (DOCARE) and Ocean Safety; Kahoolawe Island Reserve Commission (KIRC); and NOAA’s National Marine Fisheries Services’ Pacific Islands Regional Office (and Observer Program), Pacific Islands Fisheries Science Center, and NOAA Corps. Whale Entanglement In Fishing Lines Deadly « Neptune 911!